Now that there is a chill in the air....literally it's flipping freezing in New England tonight...I'm sure I'll be beading and blogging more often. ...which turned into picking up a handful of other beads I 'needed'....(to be fair I haven't gone bead shopping in many many months!) I am so happy I have nothing to do all day tomorrow!!! I realized I needed more black/gray/silver jewelry....but of course I picked up a few containers of my favorite pale pink colored beads, too! 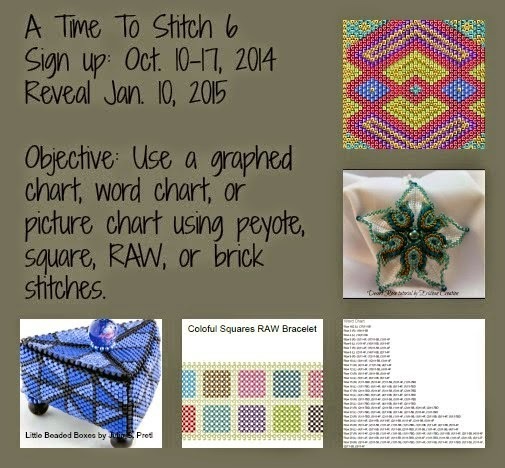 In other beady news, I signed up for Therese & Christine's A Time To Stitch (ATTS) challenge! I am super excited and grateful to them for including some references to Bead-It-Forward in the sign-ups' posts! I will be revealing some Bead-It-Forward squares for the reveal, but I also plan to work on another charted item too! The reveal is January 10! I have already completed a couple squares for Bead-It-Forward for next year. I had a heck of a time with this embroidery though and it's puckering on three sides.. The only other beading I have been doing has been to take apart some items that needed new life. 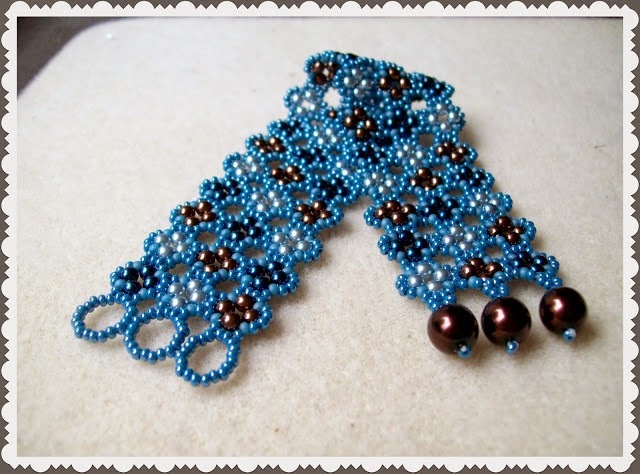 Over two years ago, I made this bracelet which I loooooooooved! But - what I didn't realize until the first day I wanted to wear it, was that the enclosure holes for the pearls were too small! So it sat in one of my "things to work on" drawers for the last two year until earlier this week, when I finally redid them and got it functioning finally! Time to go buy a blue or brown or cream or white top I think! You do such amazing work. I love the bracelet and the bead embroidery. Glad to see you are getting back into beading! I love your bracelet. I did the same one and it is a really comfortable bracelet to wear. You are going to enjoy working with the two hole beads although on some of the finishes one or both of the holes are blocked and you need to punch the holes out with a head pin. I have not started on ATTS 6 yet but do plan on doing a couple of squares for the Bead It Forward project. You may have had too tight of tension when you were beading on the bead embroidered square, that caused the puckering. I love that bracelet and have made several of them and ended up giving them all away not keeping one for my self, I need to make one just for me Huh! Enjoy you beading time. oh it is cold tonight! I am just starting to use 2 hole beads or duos, and unos, and Os .... and a few tilas. I don't have a lot, but I really love the way the patterns look that I'm seeing with these beads. I started on my ATTS 6, but I was using delicas that are 10s (yes I am aware that they are an unusual size! and likely not going to work for the bead it forward!) I think I might need to go shopping :) .... yes any excuse!